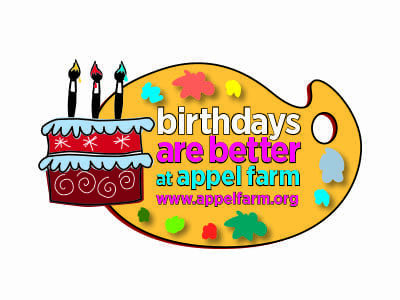 Birthday Parties are Better at Appel Farm! Celebrate your child’s special day with an art party! Birthday Parties at Appel Farm are a fun and creative alternative for artsy kids (and adults!) to celebrate their birthday with friends and family. We can customize one of our party packages to suit your interests and the age of your guests, tailoring the theme to please the birthday boy or girl. Every guest will create a unique art project that reflects his/her talents. Let us help you create the perfect birthday party for your child! Dates fill early, reserve now to ensure you get the date you want. Please check out the Important Party Information page for party availability and payment options. For more information, please contact Melissa Tevere, Director of Special Events & Conferences, at [email protected] or (856) 358-2472, ext. 124. Kids will spark their imagination in this fun and fast paced birthday party while exploring the fundamentals of theatre. 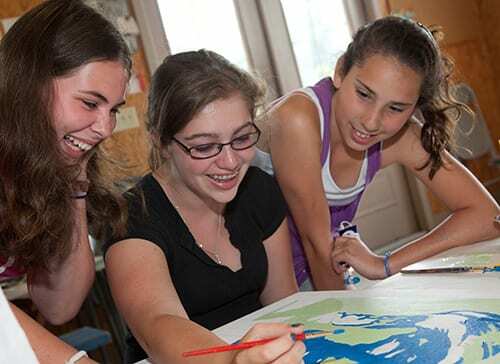 With a variety of exciting group games and activities, there will never be a dull moment. Not an actor? Don’t worry there is no experience necessary. Just a willingness to have fun! 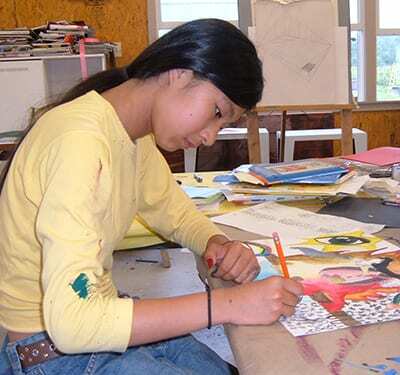 A 90-minute program lead by one of Appel Farm’s professional teaching artists in our art studio. The group will enjoy a series of theatre warm-ups and games. They will play and act in a warm and inviting environment creating scenes for their very own play! 30 minutes to celebrate in a designated party space. Let your imagination take off in this party built for fun! Through a series of fun exercises participants will unlock their creative abilities and start drawing straight from their imagination. Drawing styles include: cartooning, realism, abstract expressionism or whatever their imagination desires. Medium include pastels, pens, pencils, color pencils and markers. Everyone will be swept up in the mayhem! Each child will leave with a drawing project based on the style selected by the birthday child. Everybody needs a little sparkle in his or her life! Learn the fundamentals of jewelry making by picking one of three exciting projects: basic beading, knotting, or wire wrapping. Let our skilled jewelry expert guide you with step-by-step instructions for creating a one of a kind piece of jewelry. “Bead” creative and have some fun! Each child will leave with a piece of jewelry based on the project selected by the birthday child. 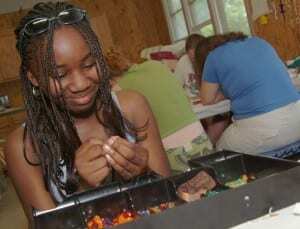 Participants will use beads, threads, fasteners, specialty wires, and other jewelry tools. When you have an art program as unique as you are, the possibilities are endless! Explore ways to use everyday found objects with paper, paint, crayons and more to create a piece of art that expresses just who you are. Free your artistic side by creating one of the following projects: found object sculpture, poster collage, treasure box or a paper mosaic vase or plate. Each child will leave with a mixed media project made up of unique materials and/or pictures based on the preference of the birthday child. Paint your party exciting! Explore the joys of acrylic painting while following step-by-step instructions to create an original painting. Available themes include: landscape, still life, abstract, action painting, or simply paint from your imagination! Beginner to advanced painters all are welcome, there is something for everyone! Each child will leave with a painting based on the theme selected by the birthday child. Participants will use paints, brushes, canvas boards, and other painting tools to make beautiful paintings. 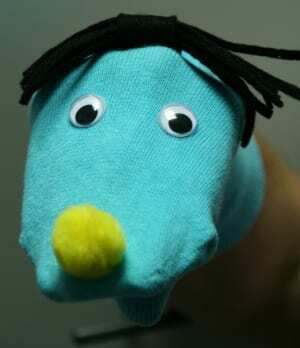 Partygoers will have a blast creating their very own sock puppets! From people to animals to monsters we will provide you with all the fabric, pom-pom’s, pipe cleaners, yarn, glitter glue and googly eyes to create any character you imagine. Then bring your new friend to life with a quick skit. Each child will use a variety of materials to create their own puppet and then learn to bring their puppet to life! 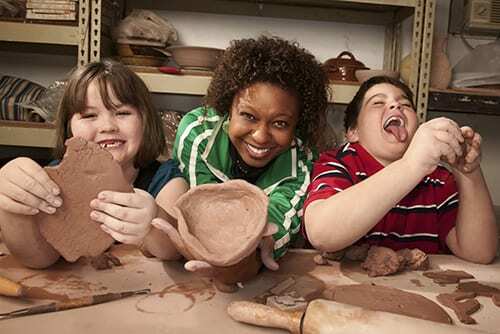 Get your hands dirty while exploring the wonders of clay! Learn the basics of hand building clay techniques to create a unique treasure that will last a lifetime. Projects include: plate, mug, plaque, or coil pot. Each child will work on a ceramic project selected by the birthday child. Participants will use low-fire clay, clay tools, ceramic cover coats and glazes. Ceramic projects will take two-weeks to be fired and glazed. Appel Farm will contact the party organizer when projects are ready to be picked up so that the party organizer may distribute to his/her guests.